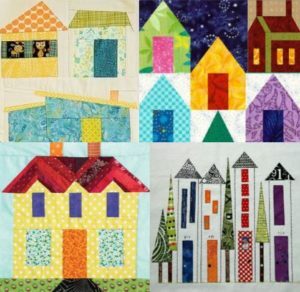 Let’s celebrate the amazing MMQG community we’ve built – with a block lotto full of houses for the August 9, 2018 meeting! Build whatever kind of house you want. Make it simple or complex. Realistic or whimsical. It can look like your house, or your fantasy house, or just some random house. Wonky or precise. Applique, pieced, paper pieced, or some combination. Make one block, or make a bunch – you’re in the drawing once for every submission. You may just walk away with a whole neighborhood of blocks to use in your next great creation! Any size, any configuration and in any color combination.